This field trip still boggles my mind to this day. If you’ve ever taken a class field trip, wipe any preconceived notions you may have, because they don’t come close to rivaling this journey into the heart of a rural Chinese village. Prepare for nearly live lunches, gigantic ancestral shrines and more food than anyone should consume in a 2-day period. On Saturday, I began my excursion into rural mainland China. 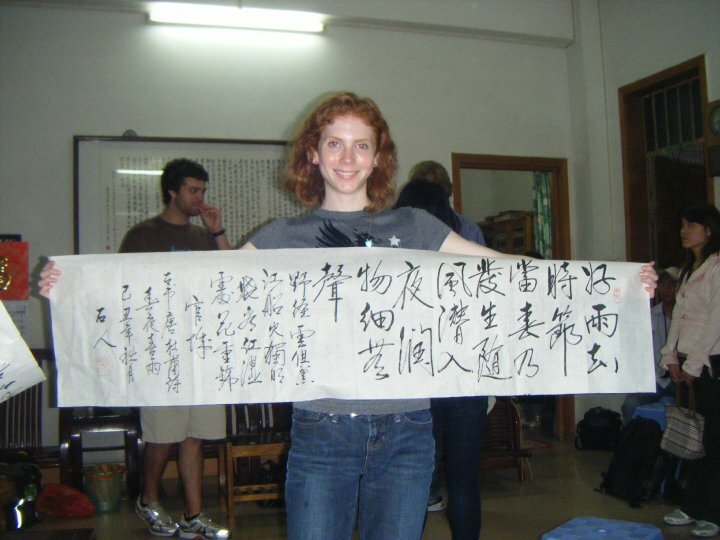 My “Marriage, Kinship, and Cross-Cultural Perspectives” anthropology class went on a field trip to Nansha, China and the Pearl River Delta to learn about lineages in mainland China. There were about 16 students and friends of students who were up for an all-expenses paid weekend to China on this trip, and we all rode the MTR to Shenzhen together where we met my professor, Dr. Ma and boarded a bus that took us to East Whiplash, China. Our first stop along the way was at the Sandilands where HKUST had a research branch. It was a pretty campus but there was absolutely nothing around the campus; no other buildings no people on campus (although it was a Saturday), nothing. The people who were working there (all 4 of them) came along with us for the rest of the field trip, and one guy brought his camera and was constantly snapping photos of the students (especially the foreign ones) – probably so HKUST would be able to show that they’ve had Westerners learning about mainland China through interactive field trips. So we picked these additional people up then drove to another town called Wang Qinsha where we had lunch. 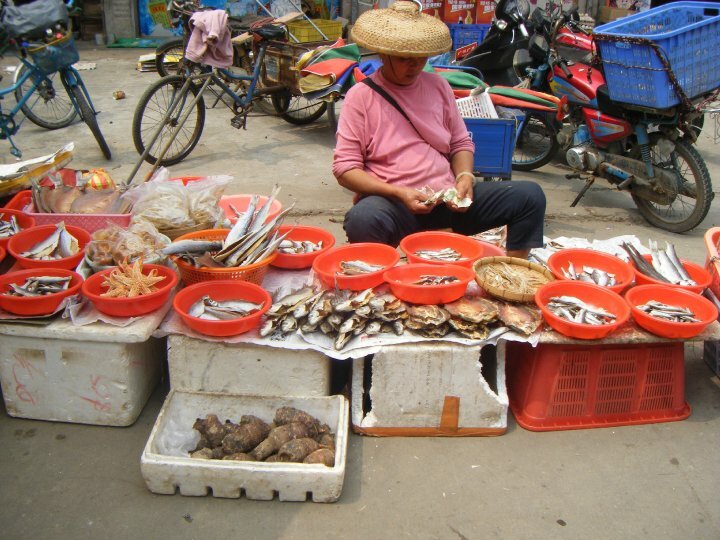 “Lunch” consisted of us being given $500 RMB and told by our teacher to go out into the open marketplace and buy live fish (and other assorted seafood) and vegetables and meet back up in 20 minutes. No kidding. This became lunch less than an hour later. Live fish, live eels or live squid for lunch? All of the above please. We ventured out, got splashed by thrashing fish, saw an eel trying to escape back to the river, haggled for fish and shrimp and clams, bought baby bananas, leeks, carrots and other unidentifiable veggies, then trekked over to a restaurant a block away, and gave all of our live, raw and still fighting assorted foodstuffs to the people working there. Then they prepared everything for us and brought it all out to some big family style tables we were seated at! Amazing; a restaurant specializing in just preparing food! Think how much that would cut down on overhead costs – no food procurement, storage or chilling necessary. What they made was so GOOD, and the dishes just kept coming and coming! The fish were delicious, the shrimp were a little small for the effort required to eat them (removing both tiny heads and legs), and there were eggplant and green beans, more fish, two types of mussels, etc. What a smorgasbord! This is the feast that came from our efforts at the market. It doesn’t get fresher than that. Afterwards, our teacher told us the whole deal (food and preparation) was about $800 RMB (less than $6 USD per person) for all 20 of our group! I’d say that’s that’s really getting your money’s worth. The final town, which was our destination (after one more 5 minute pit stop along the highway to see how the Chinese grow vegetables en masse; it’s much like how Americans do it minus any kind of machinery – it seemed to all still be done by hand) was named Huangge and we met our local expert guide there, Mr. Mai. Mr. Mai spoke no English therefore the people in our group who spoke Cantonese became our new best friends and translated all that Mr. Mai told us about ancestral lineages in China and in Huangge, in particular. 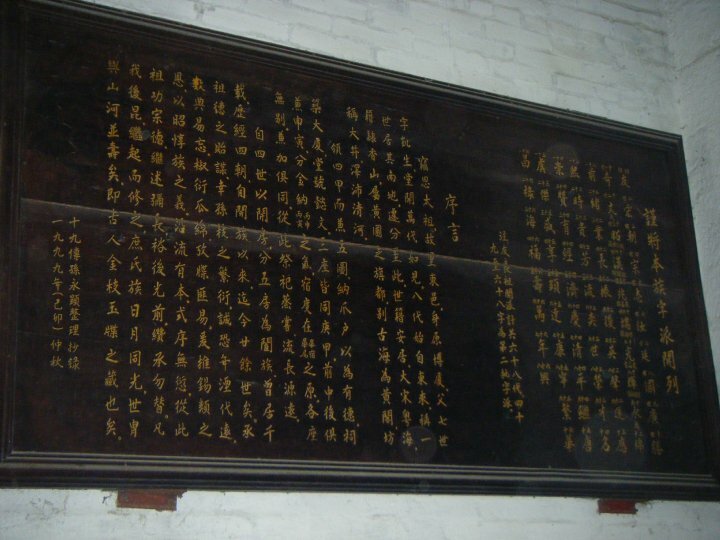 We visited three different ancestral halls, learned that the founders of each lineage had their own special day once a year when all the descendants were supposed to come together to worship them, and that there were genealogy charts in the halls that dictate the generational name each boy descendant will have. The one we saw went all the way to 68 generations! 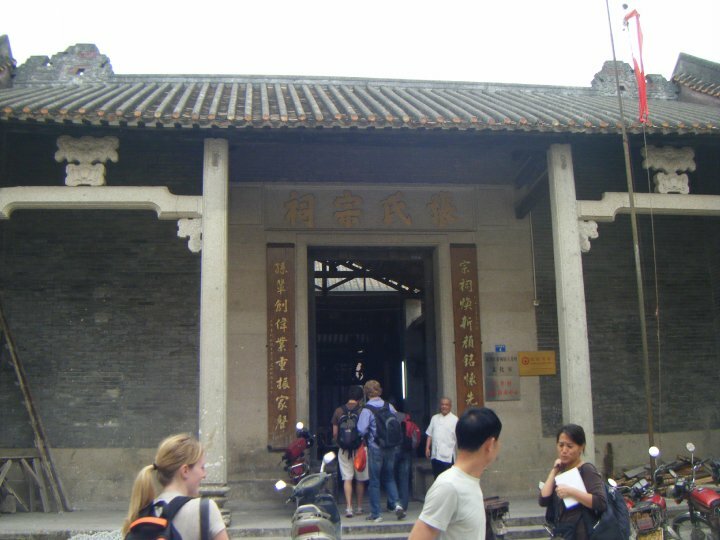 The Chang ancestral hall in Huangge proper. The genealogy chart listing all males’ names down to the 68th generation. We explored a good deal of the town while touring around with Mr. Mai too. 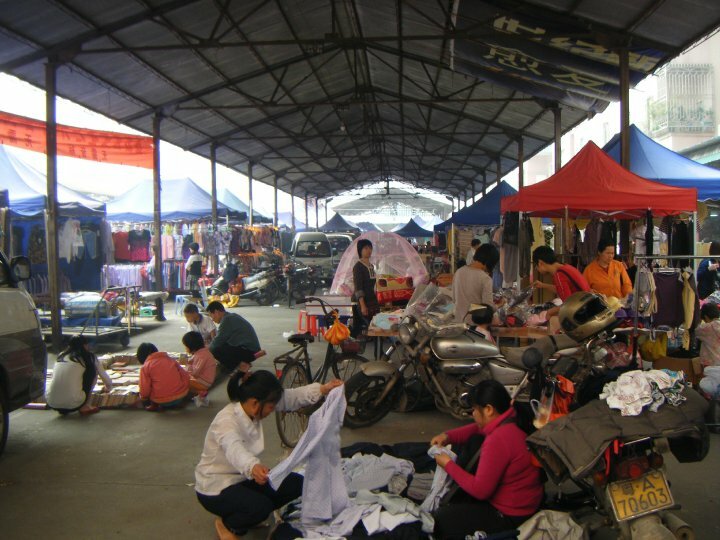 If it wasn’t for the TVs visible from every open doorway in Huangge, and the unceasing lines of mopeds and scooters moving through the tiny, crowded alleyways between houses, you wouldn’t know it was 2010. Everything in Huangge seemed primitive; the houses were old and dusty, no one turned lights on unless absolutely necessary to save money on electricity, the people were wearing traditional Chinese clothing or rags, and we walked past more than one street where they were selling fruits and vegetables on the street literally right next to someone else killing, de-feathering, and slicing up a chicken. I knew for certain at that point, that we weren’t in Hong Kong anymore. One of the many of examples in Huangge where I felt like I’d stepped back in time. Primitive. After being led around for a good three hours, we were taken to another restaurant and served more enormous quantities of food for dinner (even though we were all still full from lunch – noticing a pattern here? ), then we went to Mr. Mai’s house, which is huge by Chinese standards and asked him more questions. I had been told that he was an expert calligrapher so I asked if he would give us a demonstration and then things got fun. He brought out two practice calligraphy mats that were special because you only have to use water, but it shows up like black ink on the mats then disappears again as the water dries. Well after he impressed us thoroughly with that magic trick, everyone else wanted to try – the local students, the exchange students, my professor, the people along for the ride from the research branch – everyone. As we were all amusing ourselves with this, Mr. Mai went back to his study and whipped off about 15 copies of different poems and other famous Chinese works and just gave them to us! He was absolutely one the sweetest old men I’ve ever met, and then we asked if he could write our names phonetically in Chinese characters on the calligraphy he gave us. My name means “Wearing Jewelry” in Chinese characters. Mr. Mai’s scroll that I took home and have framed and hanging in my living room now. I love it. Finally, we went to a very nice hotel about 15 minutes from Huangge (it was in the “very nice” category because there were so many foreigners on this field trip – and by nice, I mean there were Western-style toilets and an actual English language TV channel in the rooms), took showers, some people got hour long massages for $30 RMB ($4.40 USD), and fell asleep exhausted after our long day of travelling, eating, walking, eating and eating. The next morning we returned to Huangge for breakfast and observing the local bazaar before heading to the Mai lineage’s ancestral graves and then back to Shenzhen. We dined at this little restaurant that was completely open to the outside (try to imagine how hygienic that could be in the “kitchen”), ate more food – really, really good dim sum, but way too much that early in the morning, again most of us were still stuffed from prior meals. You do see a pattern emerging, right? 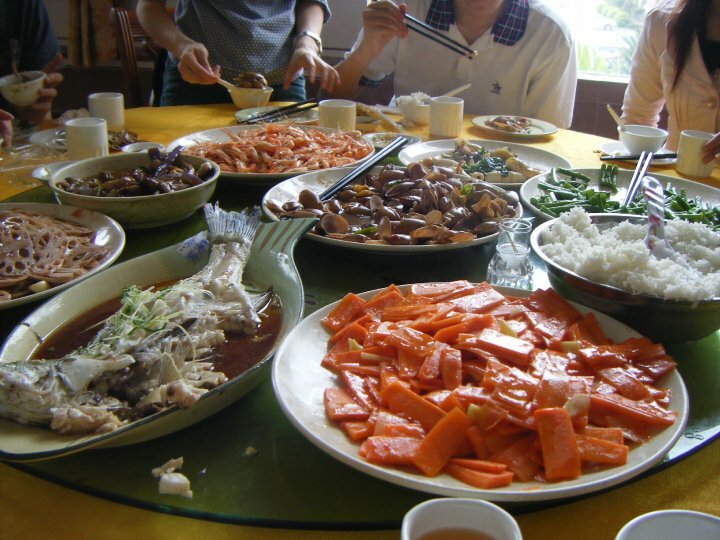 Everything in China seems to revolve around food and when, where, and how the next meal will be. I really don’t understand how they stay as slim as they do – the diet consists entirely of rice, noodles, egg yolks, fried foods, skin, fat and bones of any and all kinds of meats. Anyway, we ate yet again, and then went to see the market that was selling absolutely everything! If you wanted pet turtles, jade bracelets, candy, blue jeans, razors, combs, baby clothes, anything, you could buy it there for dirt cheap! It was only a pity we didn’t have more time to spend there because we all could have used hours to wander through this place and try to haggle for things we didn’t need with the help of the students who could speak Cantonese. This looks like a rummage sale gone bad, but it’s actually a fully-functioning market. And nothing’s over $5. After the market, we went to the ancestral grave site, Mr. Mai told us about how only the founders and most important members of each lineage were allowed to be buried there, we took pictures, thanked him for all his time and hospitality and drove back to Shenzhen where our group disbanded and most people headed home for HKUST in the afternoon. I, however, chose to stay with three other exchange students and do a little shopping and sight-seeing in Shenzhen since we were already there, anyway. The first place we went was Dongmen where there are all kinds of open-air street markets to shop at and lots of great street food to consume. As we explored, bargained for various trinkets and cheap clothing and just ogled at the knockoffs for sale, we also ate a lot (again). I had spicy pork on a stick and pork schwarma, which was pork shaved off a giant vertically rotating stack of meat on a huge skewer and then stuffed into a hot bun sliced halfway open (good thing no one was Kosher on this particular excursion). Both were delicious and quite spicy, but since going to China my spice tolerance increased dramatically. Then, we went over to Luo Hu Shopping Center, which was a structure five floors of stalls selling every knock off you could ever want; handbags, shoes, DVDs, jewelry – as well as having a fifth floor dedicated almost entirely to tailors who would make custom-made suits or dresses or anything else you could imagine for a song. 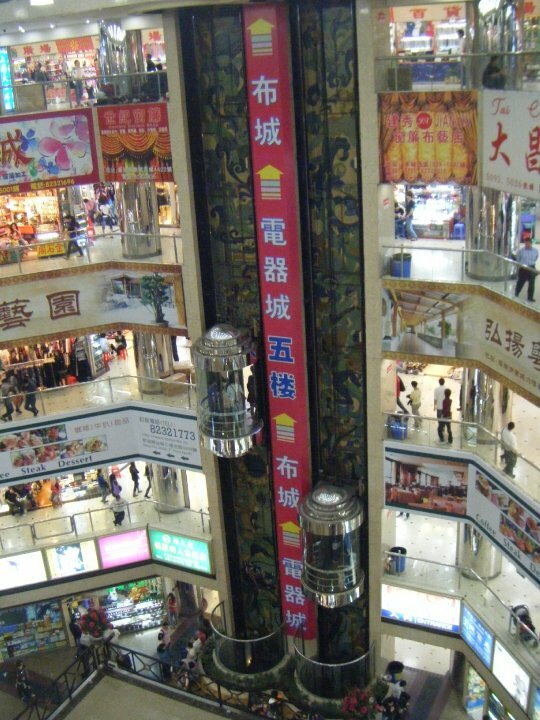 The 5-story Luo Ho shopping center where you could find your fabric and tailor it too. While picking up a few bootleg DVDs, a lighter, a fake purse and any other odds and ends you never knew you needed. It was so cheap it was unbelievable, and the other half of the floor was where they sold all the fabric, so you could pick your design then go with your tailor to buy the fabric, they’d take your measurements, sew it up and some tailors would even mail it to Hong Kong within a week of ordering. Amazing! In all, we ended up staying in Shenzhen until about 10 pm before finally taking the MTR back to Hong Kong and collapsing into bed. The only fly in the ointment for the whole weekend was the fact that we had to carry our backpacks (full of everything for taking notes, changes of clothes, toiletries, etc.) 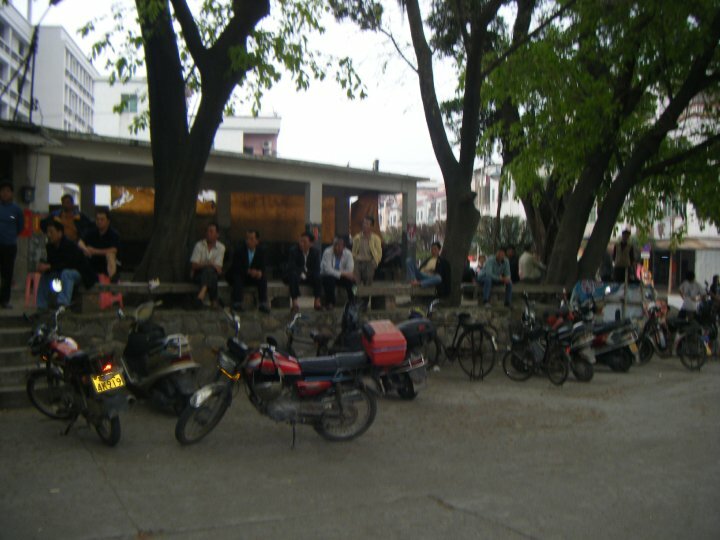 around everywhere we went, even in Huangge, because it wasn’t safe to leave them on the bus where they might be stolen. Needless to say, I was pretty exhausted and my back was pretty stiff when we would get those rare respites to sit down and put our things on the ground for a bit. But other than that, I had an experience and a taste of China I will definitely never forget and probably never experience again. Although, our professor had said there was another field trip in the works later on in the course it never came to fruition. Which may have been a good thing – people were pretty whipped after the first go-round. Stay tuned for the next adventure. We reunited with our local buddies for more dinners of unknown origins, photo booth silliness and tofu desserts? 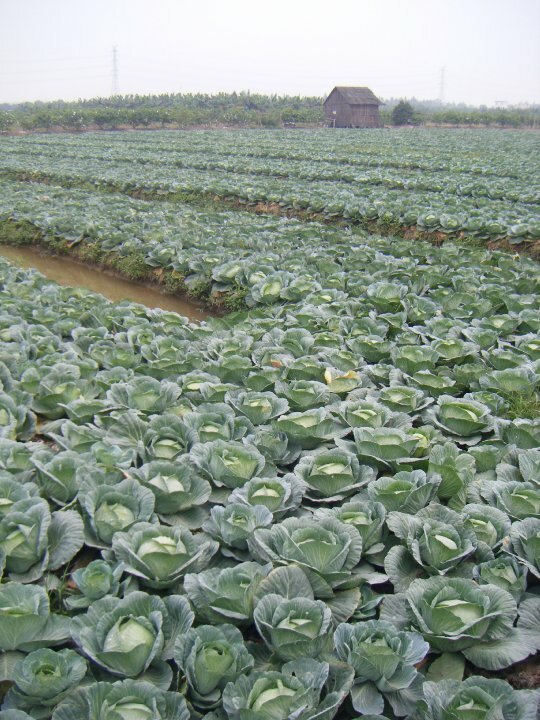 Real, live cabbage patch. I didn’t see any babies in there though. 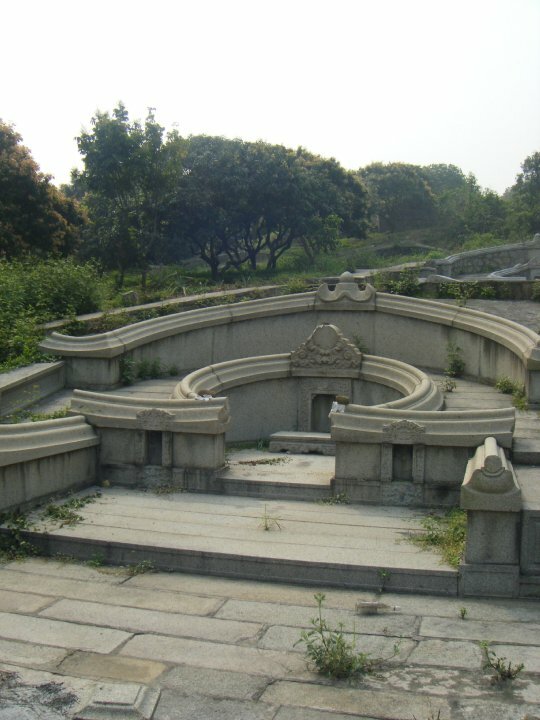 The Mai ancestral grave site we visited after Huangge. 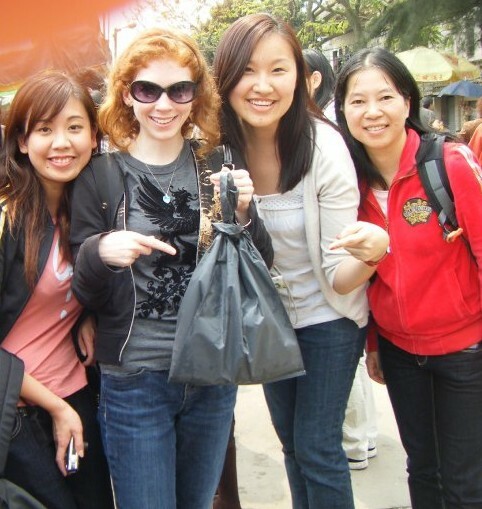 This entry was posted in Asia, China and tagged Asia, China, Chinese Scroll, Field Trip, HKUST, Hong Kong, Huangge, Nansha, Shenzhen, Shopping on March 19, 2014 by Paige N..